Making chicken fettuccine alfredo from scratch is easier than you think. You’ll never buy alfredo sauce by the jar again after trying this simple chicken fettuccine alfredo recipe. It’s a quick and easy dinner that’s perfect for those nights when you don’t have much time to cook but still want a delicious meal. Chicken fettuccine alfredo may be a meal you usually only get when you go out to eat, but it doesn’t have to be anymore with this recipe. You’ll be adding this chicken fettuccine alfredo recipe to your collection after one taste. You’ll savor every delicious bite of this dish. The creamy sauce, juicy chicken, and tasty pasta make it the ultimate comfort food. Everyone you share this dish with will be asking you for the recipe, and your family will be happy you made it! At the end of the meal, they will be full and very, very satisfied. Cook your fettuccine al dente according to the instructions on the package — do not overcook your pasta. Drain it and set it aside. Add the cooking oil to a frying pan and turn to medium heat. Cook the chicken until you don’t see any more pink. You can make sure the chicken is cooked by cutting into a piece. Once the chicken is done, set it aside. Add the butter to the pan you used for the chicken. Once the butter is melted, add the minced garlic. Sauté the garlic over medium heat until it is golden brown. Add the cayenne pepper, salt, and black pepper. Add the chicken back to the pan and stir until the spices are evenly mixed. Add a quarter cup of the cream and the egg yolk in a separate bowl. Whisk it until combined and set aside. Add the remaining 3/4 cup of cream to the chicken mixture and increase the heat to medium-high. As the cream starts boiling, whisk quickly and slowly add the egg mixture. Whisk until all the ingredients are blended well. Add the parsley. Stir until combined. Slowly add the parmesan cheese, stirring as you add it. Mix the ingredients until the sauce is smooth. Add the fettuccine and toss the pasta with the chicken and sauce. 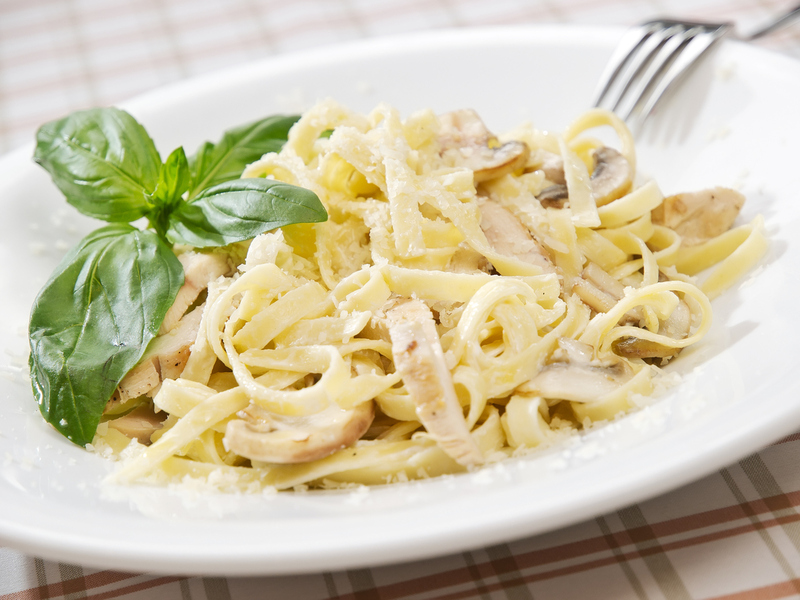 Using Sauder Eggs in this homemade chicken fettuccine alfredo recipe makes it extra tasty. Use our store locator to find a store near you to get our top-quality eggs. Whatever you’re making, our eggs will turn your recipe into a delicious, home-cooked meal everyone will love.